Flexible Beading Wire is one of the most versatile types of stringing materials. It is a flexible beading wire made of stainless steel and covered with nylon, making it a nice combination of strength and flexibility. 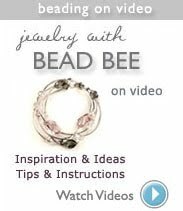 It works with most types of beads including glass, crystals and gemstones, and pearls and very is easy to finish by using just a few findings such as crimp beads, jump ring, lobster claw clasp and a crimp tool. Flexible beading wire is available in several thicknesses, light, medium and heavy. For most projects, choose medium flexible beading wire with 49 strands. If you are using heavier beads, heavy weight beading wire may be a better choice. For gemstones or pearls with smaller holes than most beads, you may need to use light flexible beading wire because it is slightly thinner. In order to attach a clasp or findings to flexible beading wire, you will need crimp beads, a crimp tool and a flush cutter. If you need help getting started with crimping, click here to get illustrated crimp bead instructions from our website. 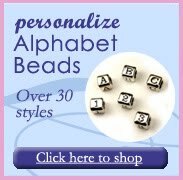 Stretch Bead Cord or Elastic - For making stretch bracelets, you will need a type of stretch cording or elastic. There are many different types, colors and thicknesses. 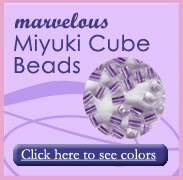 I have used many types and now favor the gossamer stretch cord that we carry at Bead Bee. It knots well and stretches well. There are some brands that barely stretch so they are not as easy to put on. Another type of stretch cord that is easy to use is a type often found in sewing shops, it is a rubber cording that is covered in polyester thread. When the cord is cut, the polyester thread will fray, but you can simply singe the ends. I like this type of elastic cording too because it is durable and the knots hold. I love making and wearing stretch bracelets - you don't need clasps and findings, and sometimes it is nice for a bracelet to be beaded all the way around and not be interrupted by a clasp. Memory Wire - Like stretch cord, memory wire does not require clasps and findings. You will need a special memory wire cutter and pliers to curl the ends to secure the beads. Memory wire is springy and maintains its round shape so a clasp is not required to fasten it on your neck or wrist. Memory wire usually comes in a coil, you can cut it at any length to create single strand, bangle like bracelets, or cut more coils for multi-strand, cuff like bracelets. Simply curl the ends to keep the beads from falling off. Memory wire bead ends are also available, they are beads with one hole, that can be glued onto the ends of memory wire. Wire - Beads can be strung on hard wire and head pins and linked together to create beaded chains. Wire wrapping techniques are necessary to do this. The tools needed for wire wrapping include round nose pliers, a flush cutter, chain nose pliers and a flat nose plier with tip. Chain - Chain is not really a stringing material, but using chains and wire to wire wrap beads together can create beautiful designs. Beads can be strung directly onto chain such as ball chain or snake chain. We are happy to help you choose the right materials and techniques for your project so feel free to call or email us, you can even include pictures to assist in answering your questions. Soft Flex or Flex Rite?